The Big Bang Theory: "The Toast Derivation"
One of my favorite sitcom devices is the episode where one of the characters decides to get new friends and ends up finding friends who are far less suited to them than the regulars. This was the basic idea behind one of my favorite late-period Seinfeld episodes, “The Bizarro,” and I at least crack a smile every time the basic premise comes up. So when I read the logline for tonight’s episode of The Big Bang Theory, I thought it might end up being a favorite. At the very least, I thought it would be something I’d laugh at a few times and then turn off, basically glad I’d spent another half hour with the gang. Instead, it ended up being one of the worst episodes of the season. It was flat and unfunny. (I jotted down a bunch of lines, but I think I only actually laughed at one of them, and the others just struck me as sort of fun turns of phrase. Also, I could use them to pad out my word count. So.) Outside of one scene with the three girls, the episode felt dull and lifeless. I came into this episode wanting to be nice to the Chuck Lorre show without a cast member who’s apparently a raging psychopath. (Seriously, I didn’t know it was possible to feel this much sympathy for a television writer, but there you go.) But it was just not very good. Problem #2: Live studio audience. The general idea is that there’s nothing worse than a live studio audience laughing at a joke that you just don’t find funny. And I’ll often agree with that sentiment. When the traditional sitcom went out of favor at the beginning of the last decade, the complaints from fans were often about the audience, but the writing certainly wasn’t doing those shows any favors. Hearing an awful, hacky joke, and then hearing a bunch of people laugh at it can be tooth-grindingly irritating. But I think even worse is when an audience gets on a real roll over something that’s not only not funny but funny in all the ways you find worst. I really can’t stand “laugh at” humor, where someone is ridiculed because of what makes them different. That whole scene where the audience hooted and howled with laughter at Kripke saying “raffle” but pronouncing it “waffle” (with the short A sound) made me cringe, especially when they laughed even harder at Sheldon’s accidental mispronunciation. It just set the wrong tone. Problem #3: Priya’s not a character. She’s a plot device. At first, I thought the show might be trying out something new with her character, but in this episode, she’s just there to take Leonard away from Penny, so she can fret about it. She doesn’t add anything to the scenes she’s in, and Raj’s discomfort over seeing his sister make out with Leonard is already getting old. When Priya first came around, she was kind of fun, but subsequent episodes have sunk the character, making her a convenient way for the show to push Leonard and Penny back together, when that plot has always been one of the show’s weakest elements to begin with. And that also results in the show returning to that romance again and again, when there’s no real evidence of why these people would be doing this. Sure, push Leonard and Penny back together at some point, but lord, do it in the series finale, so we don’t have to see it again. On the other hand, I really liked that scene where the girls hung out at Penny’s place. Bernadette and Amy’s way of living vicariously through Penny was very amusing, and the way they eventually talked her into getting all dolled up and heading out on the town was cute. The scene wasn’t nearly enough to save the whole episode, but it certainly put me in a better mood than everything leading up to it had managed to do. It was followed by a couple of mean-spirited scenes featuring the guys (who increasingly seem like they can ONLY be mean-spirited without the girls around), but I did kind of like the other guys realizing they did, grudgingly, enjoy having Sheldon around. The show makes a big deal out of how annoying he is to the other guys, but they clearly have some affection for him if they keep inviting him to stuff like this, and there needs to be acknowledgement of that from time to time. 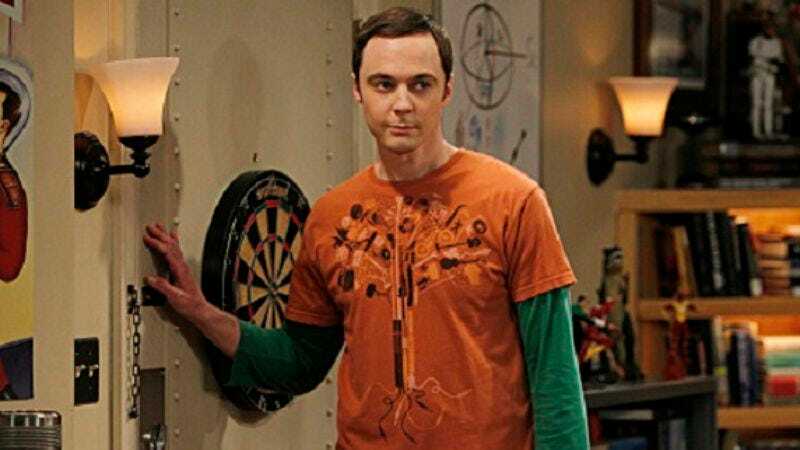 Usually, when I write about The Big Bang Theory, I talk myself out of whatever grade I’m going to give it. This time, I started out angry at the show, but I ended up just being kind of tired about it. “The Toast Derivation” maybe isn’t as bad as I suggested above, but it isn’t good either. This is very much all about the show marking time, and it didn’t bother to do very much with its one interesting idea, instead deciding to give in to its worst impulses. I disagree with those people who say The Big Bang Theory is THE WORST SHOW ON TELEVISION, but, man, “The Toast Derivation” briefly made me want to agree with them for a little bit there. Until Sean O'Neal gets up and posts the inevitable Newswire about the event, here's your official space to talk about what a jackass Charlie Sheen is and how Chuck Lorre seems to give off a strange pheromone that only celebrities who will come to hate him can smell. "What if he serves haggis and blood pudding?" "A margarita? Where are we? What is happening?" "Windbreaker for my cape, and a stern expression for my cowl." "I'm the whimsical elf that everyone looks toward for a good time." "I always shout holy moly. Don't know why. Just do." "Saying that while holding a snowflake's a little heavyhanded, don't you think?" "They were having fun wrong."